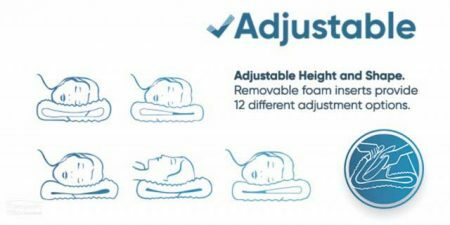 The Complete Sleeprrr: Memory Foam Plus is a premium pillow for someone who needs a firmer pillow to support their cervical spine or neck while they sleep and is suited to larger adults. 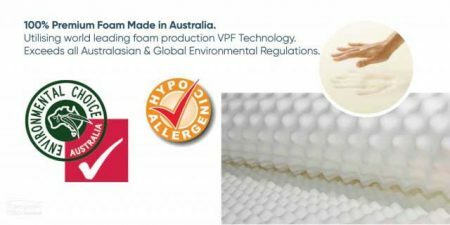 This Complete Sleeprrr Pillow is 20% firmer than the Complete Sleeprrr: Memory foam Original Pillow and is made with temperature sensitive visco elastic memory foam. 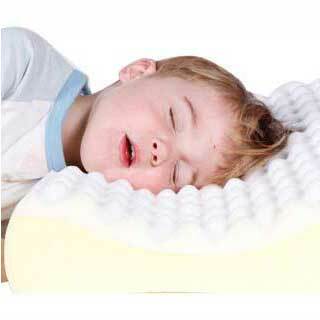 This pillow moulds to the shape of your head and neck while you sleep to give you the ideal support you need. 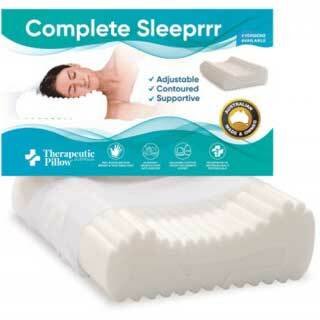 This therapeutic contoured pillow is ideal for those people who sleep on their side. 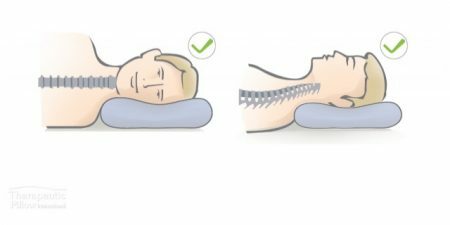 This pillow is extremely supportive for people who are larger framed or want a firmer pillow to support their cervical spine and neck while they sleep. This pillow provides the support you require with the comfort you want. 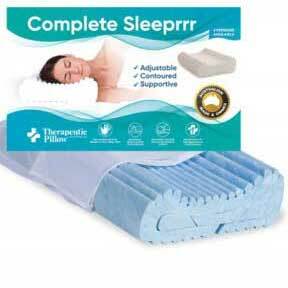 The Complete Sleeprrr range of pillows come with a higher and lower side to suite your individual needs. 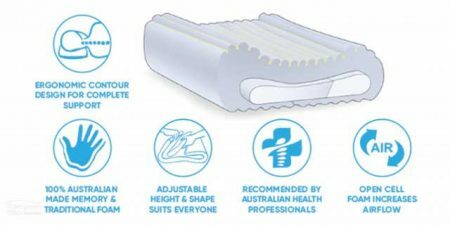 It has a removable insert so you can make the Compete Sleeprrr specifically tailored to your needs and can be adjusted into up to 12 positions. 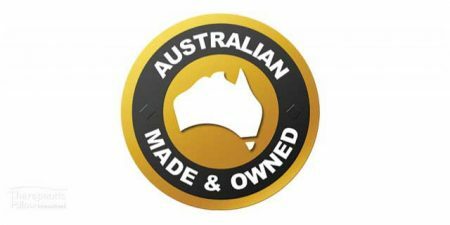 This pillow is a firm pillow and ideally suited to people who sleep on their side and are larger framed or someone who requires a firmer pillow. If you are smaller to medium/average size framed person we recommend the Complete Sleeprrr: Memory Foam Original Pillow. 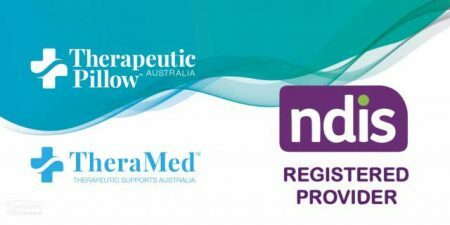 If you overheat at night or sweat and require a soft feel therapeutic memory foam pillow that also keeps you cool at night we would recommend the Complete Sleeprrr Gel Memory Foam Pillow. Fantastic being able to tailor this pillow. Very comfortable, has certainly improved my neck issues. Wow…. what an amazing product! I brought one foam pillows then a week later another one for my husband who has terrible sleep apnea. After recovering from an operation, this pillow was a life saver, not to mention the volume control on my husband’s snoring also lough out loud. A great sleep, a great rest and we would never buy another pillow again. The only other thing I would buy is a waterproof cover as these pillows can’t be washed, but that’s nothing for an amazing nights sleep. This is the 3rd complete sleeprrr pillow I’ve had, this model is the best, no more headaches or a sore neck. I’m a side sleeper and would highly recommend this pillow for anyone! This is my second time bought this pillow. I have tried so many different pillows even more expensive one but I have to say this is the best one ever. Very supportive especially if you have sore neck issue. No more sore neck/headache when I get up in the morning. Good pillow does make a lot of differences. The pillow is not heavy, I always bring it with me everytime I travel overseas/interstate. I will order an apnea pillow for my husband to use. Also I should mention the delivery is quicker than what I expected. Thanks also for helping me to cancel my order last time. Only pillow I will now sleep on as I wake up without my neck hurting, it is fantastic!! 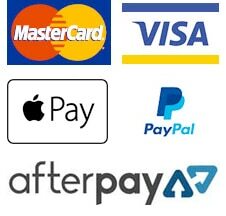 I have suffered with severe neck pain for over 20 years. I can honestly say that purchasing this pillow has changed my life. I can sleep soundly through the night, without tossing and turning because my neck hurts. I will be buying this pillow for the rest of my family. I was so happy I got 3 for the family. Helps getting us a good night’s sleep and no more sore necks and back issues. I love this pillow – this is my second one. After my first one finally died, I tried using an alternate type of pillow and ended up with sleep issues and neck problems. I decided to order a new pillow and it was worth the wait and the cost. My first night sleeping on this pillow was sheer bliss. No more bad neck and insomnia. The Best Pillow by Far. You will never go back to a basic old pillow. We have had many pillows over the years and after looking around for a different type of pillow that would support my neck we came across this type of pillow My wife and I have always had bad sleeps and mostly due to neck problems, this Complete Sleeprr pillow plus is just tops, you can adjust it to what you like , we have been using this pillow now for about 10 plus years and we would most definitely recommend this type of pillow to any one that wants a good night sleep. You will never purchase another pillow brand or a different type of pillow , but you will definitely be back to getting another Complete Sleeprr in the years to come. Amazing pillows – well worth trying! Really it’s the LORD’S bounty that I found this pillow, a mother with children whom used to suffer day and night , now alhamdulILLAH ( all thanks to ALLAH ) this pillow really made a big difference, now at least I don’t have a sore neck day and night by ALLAH’S will. Best pillow for my neck. Purchased complete sleeper memory foam plus pillow. Normally wake with a headache but they have lessoned dramaticlly with this pillow. My head and neck feel totally supported. Great for the neck . Helped me get outta cervical pain. My sleep has improved with this pillow. Highly Recommended for great neck support & posture. My snoring also got better with the use of this pillow. Great purchase. 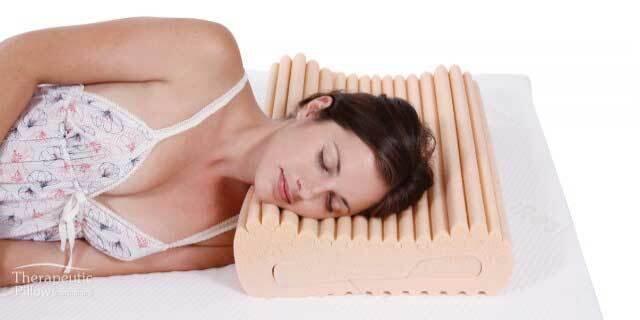 Great pillow to use as I had sore neck for weeks. I had better days but some day I couldn’t even move my neck. My chiro recommended me to try this and within few days my neck was back to normal!! I have been looking for a good Pillow for years. I have a bad back and I get up a lot in the night to go to the Toilet, which is because of my back. I have used my Daughter’s Sleeprrr Memory Foam Pillow Plus for a couple of weeks now and my back feels better and I don’t get up in the middle of the night like I used to. And I sleep on my side. The Sleeprrr Pillow Plus has been fantastic. I highly recommend the Sleeprrr Pillow Plus to everyone. 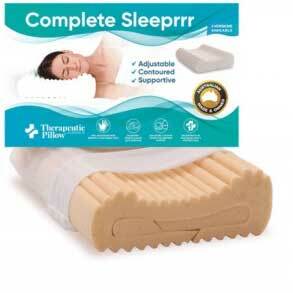 After enduring a couple of weeks of a sore neck after waking up, B2B recommended one of the Sleeprrr pillows. I tried this one, and withing a few days, my sore neck was gone. Its a great pillow with quite a few options for using; a high side, a low side, a flat side, and then you can remove pieces from inside to make it even flatter. I prefer the high side personally, whereas for years I use two pillows. Not the best for a good sleeping posture. Just make sure you replace when necessary. Pillows, like mattresses, have a life span too.